The Bedfordshire County Football League moved into the first round of the 2015-16 season FA Inter-League Cup with a dramatic penalty shoot-out win over The Surrey Elite Intermediate League. Trailing to a goal from Tom Henzi in the 15th minute they were to draw level just 12 minutes from time via a header from Renhold’s Justin Newman to take the game into extra time. Surrey, via Ben Thorne were to restore their lead in the 98th minute only to see Jamie Cerminara (Marston Shelton Rovers) even things up with the last action of the game to make it 2-2 and bring about a penalty shoot-out. First up were the visitors who saw home goalkeeper Liam Jahn (Eastcotts AFC) beat out Lewis Aylott’s effort before their goalkeeper Clark Gooding saved the opening home effort from Jack Weeden (Marston Shelton Rovers). The next eight efforts were all duly despatched by Surrey’s Tom Henzi, Tariq Sidoui, Luke Willoughby and goalkeeper Gooding against Beds replies via Mark Reed (Renhold United) Ryan Lewis (Shefford Town & Campton) Jonny Richens (AFC Oakley M&DH) and Jamie Cerminara to take the tie into sudden death. Like in the opening sequence both the first penalties were saved, Stuart Baldwin missing out for the visitors and Mark Smith (AFC Oakley M&DH) for the hosts. Home goalkeeper Jahn then made his third save of the afternoon from Rob Lewis to give Jack Goodacre (AFC Oakley M&DH) the honour of banging home the winner to take the hosts to a 5-4 win. AFC Kempston Town & Bedford College saw their 11 game unbeaten run ended when losing 0-2 at home against Wootton Blue Cross, Phil Matthews netting both of the goals to do the damage. For Sandy it was just home win number two of the season and the local bragging rights after they ran out 2-1 victors over bottom of the table Ickwell & Old Warden. Jonnie Stratford and Jahrome Mullings were on their scoresheet against a lone reply via Andrew Vallom. The boys from The Green now find themselves seven points adrift at the base of the table following Caldecote’s 1-1 draw at Sharnbrook. Shaun Barnett was on the home scoresheet against a Caldecote reply via Stuart Haddow. Cranfield United are now five points clear at the head of the Division One supported by Wests Citroen Bedford league table after a lone goal from Jordan Appleton was enough to take them to a 1-0 victory at bottom of the table Marabese Ceramics and then learn second place Elstow Abbey had lost 0-1 at home to Queens Park Crescents to prevent them taking their home unbeaten ways into double figures. Shazed Satter was the Crescents goalscorer. For third place Henlow it was a share of the spoils in a 3-3 home draw with AFC Kempston Town & Bedford College Reserves. Russell Ayles netting all three goals against Town replies via Ashley Windridge, Keegan Roberts and Anas Bechkoum. Whilst now up into fourth spot are Sundon Park Rangers who took their winning ways up to five games with a 4-0 home win over Riseley Sports. Nash Bennett netting twice alongside single goals for Shaka Anderson and Kane Griffiths. The Rangers jumping above Great Barford in the league standing following their 1-0 defeat at Shefford Town & Campton Reserves who with a goal from Stuart Pearce were taking their unbeaten ways up to seven games. Down at the other end of the table AFC Harlington moved themselves out of the drop zone with a 3-1 home victory over Meltis Albion. Jon Murray, Scott Gadsden and Curtis Stirling on their scoresheet against a lone Albion reply from Craig Damon. Replacing them in the drop zone are Bedford SA despite them sharing the spoils in a 3-3 draw at AFC Oakley M&DH Reserves. Josh Hislop, Daniel Bentley and Ray Patrickson on the home scoresheet against SA replies from Daniel Lupton, Ashley Banton and Tom Marwood. The game of the day in Division Two was to go the way of leaders Stevington who ended third place Westoning’s unbeaten 20 game run with a 3-1 home victory over them to push them six points clear of their conquerors, who nevertheless have still played two games fewer. Joe Holyoke netted twice and Jordan Wright once for the home side against a lone reply from Bryn Reynolds. Just two points adrift of Stevington, and four ahead of Westoning who have played two games fewer, are FC Houghton who took their unbeaten run up to 21 games with a 7-1 victory at Renhold United Reserves. Paul Taylor netted four times, James Matthews twice and Mark Doran once against a lone United reply via Nathan France. Down at the other end basement side Wilstead Reserves are still looking for their first home win after being beaten 4-1 by Marston Shelton Rovers Reserves. Gary Russon twice plus Charlie Roberts and Lewis Cerminara were on the Rovers scoresheet against a lone reply from Matt Thompson. Whilst third from bottom of the table Meltis Albion Reserves were running out 3-2 home winners over Kempston Athletic. Josh Pierre St Clair, Kade Walker and Carl Townsend on the home scoresheet against Athletic replies via Sean Betts and Gavin Matthews. Meantime Bedford United chalked up away win number three on the bounce with a 5-4 victory at Elstow Abbey Reserves. Rory Cochrane with a brace was joined on the scoresheet by Aaran Perrett, Jamal Dixon and Tom Wade to bring up the nap hand.The Abbey replies came via an Andy Klein hat-trick and a goal from Jason Harrison. Elsewhere, Moggerhanger United ended their three game losing away run by sharing the spoils in a 2-2 draw at Kempston Hammers. Martin Bennett and Dan Havil on the Hammers scoresheet against two in reply from Brandon Bates. 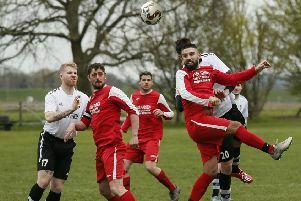 Cranfield United Reserves were crowned Division Three league champions for season 2014-15 following their 5-0 victory away at Westoning U20 to take their winning ways up to eight games. David Adderson, Daniel McLaren, Phil Distin, Joe Sames and Jordan Conway all found the back of the net to bring up the nap hand. Whilst Lea Sports PSG duly collected the silver medals after winning their eighth away game on the bounce 3-2 at White Eagles. Tom Durrant, Ryan Darby and Tom Doran netting the vital goals against Eagles replies via Martin Ptak and Przemyslaw Kala. Still with hopes of a top three finish are Atlectico Europa who took their winning home ways up to four games with a 4-0 win over Clifton who were losing for the ninth away time on the bounce. Daniel Green with a brace plus an own goal and a strike from Aaron Hill doing the damage. Down at the other end of the table, Mid Beds Tigers are now unbeaten in their last three starts after sharing the spoils from a 2-2 home draw with Dinamo Flitwick. Brad Dennis and Jay Smith on the Tigers scoresheet against two in reply from Dale Goldie. Whilst Caldecote U20 won for the first time on the road this season with a 2-1 victory at Sandy Reserves. Scott Lancaster and Jamie Richardson netting the vital goals against a home reply from Jonnie Stratford who earlier in the afternoon had netted in the home sides Premier Division supported by Sportsform game. Elsewhere, Shefford Town & Campton A were running out 3-0 home winners over FC Serbia, Scott Frusciante netting twice and Jay Smith once.